The result of this reverie was Casablanca, a floral chypre fragrance with a lengthy list of notes: pink grapefruit, red mandarin and black currant bud absolute; orange blossom, tuberose, jasmine and ylang ylang; labdanum, oakmoss, vetiver, hyraceum, civet, benzoin and musk. Casablanca's name made me think it would end up as a lily fragrance on skin, but not at all: it's an earthy, indolic tuberose perfume. And its base is gloriously old-fashioned, musky and animalic under those overripe fruit highlights and rich florals. Despite its "garden in paradise" origin, Casablanca reminds me less of an actual garden than an antique sepia-toned photograph of a white flowers on a bed of moss — it's deep and densely layered, with an abundance of shadows. But what if a dramatic throwback like Casablanca isn't your style? I can recommend two other fragrances that incorporate white florals and may offer cheer and comfort on a wintry day. I haven't tested anything from Ellis Brooklyn since I reviewed Rrose in 2017, and I still stand by my original response to the brand's marketing angle. Still, when a sample of Ellis Brooklyn's Fawn showed up in a Sephora order, I decided to give it a try. Fawn includes notes of neroli, bergamot, magnolia, damask rose, lily of the valley, coconut milk, amber, vanilla and musk; it was developed for Ellis by perfumer Pascal Gaurin. It turns out to be a casual yet polished "fleurmand," with a generous dose of neroli, a creamy white floral heart (more of a contemporary jasmine, to my nose, than magnolia or lily of the valley) and a gauzy, musky-sweet coconut accord. If Fawn were a young woman, it/she would pair a fuzzy sweater and boots with bare legs and flowing, hatless hair on a cold day. If it were a beverage, it would be a smoothie. I usually reject anything that smacks of "effortless beauty" or commercialized "wellness," but just like that friendly gal in seasonally inappropriate dress or a tasty blended fruit-and-yogurt drink, Fawn ends up being pretty darn likable. And here's one more summer-in-winter pick: Miu Miu Fleur d'Argent, which is reportedly "all about preciousness and elegance: the Miu Miu family grows by exploring a more feminine and sensual facet of the Miu Miu girl." It was developed for Miu Miu by perfumer Daniela Andrier and includes notes of tuberose, jasmine, orange blossom, Akigalawood (a fragrance material copyrighted by Givaudan) and musk. Fleur d'Argent definitely feels like a sister to the original Miu Miu fragrance and its younger sister L'Eau Rosée. It has the same peppery-wood note running throughout, and the same lily of the valley accord that still reminds me pleasantly of something from the 1980s. This time around, instead of L'Eau Rosée's black currant motif, we get a bright, almost astringent orange blossom note singing out over the pepper and sheer wood and lily of the valley. Just like the first Miu Miu scent and its other flankers, Fleur d'Argent is a perfume-y perfume. Unlike St. Clair Casablanca, it doesn't feel as though it contains any natural ingredients, and unlike Ellis Brooklyn Fawn, it lacks any relaxed, #wokeuplikethis vibes. Fleur d'Argent is fabulously fake, like some rhinestone brooch that you'd pin jauntily onto the lapel of a retro-chic Miu Miu jacket. All three of these fragrances, incidentally, have above-average longevity, so all three of them have accompanied me throughout some chilly days with early sunsets. I actually prefer wearing white florals and skin musks in cold weather rather than summertime. (Where's my bottle of Guerlain Terracotta, come to think of it?) Just as Diane St. Clair suggests, I can appreciate an evocation of a "tropical oasis" even better in the midst of winter. 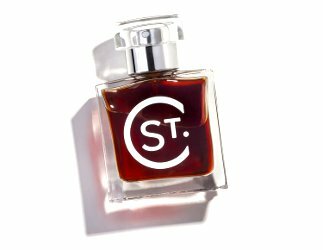 St. Clair Casablanca ($190 for 30 ml Parfum) is available through the St. Clair Scents website. Ellis Brooklyn Fawn ($100 for 50 ml Eau de Parfum) is available via Sephora, Beautyhabit and the Ellis Brooklyn website. 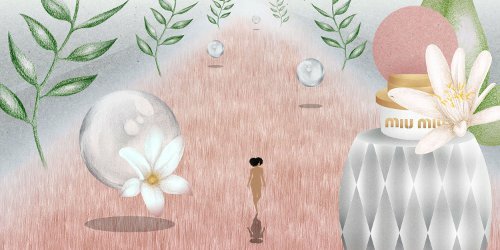 Miu Miu Fleur d'Argent ($77 for 30 ml, $99 for 50 ml, $132 for 100 ml Eau de Parfum) is available at Sephora and various department stores. They can really give a sensory “lift” on a cold and cloudy day!! Ok, ordered Miu Miu samples from eBay (too lazy to go to Sephora). Thanks for writing the review, Jessica! lol. I’m lazy, too…but there happens to be a Sephora directly in the path of my daily commute, so. I used to know a girl who fits the description for Fawn. I think I will skip that one 😉 actually, the Miu Miu, probably appeals to me most. Hah! Yes, these three different fragrances have different “personalities,” so I’m not surprised that one fits you (or me) more than the others! Hearing lots of talk about Casablanca on here, might have to get me a sample. Thanks, Jessica. Me too–have heard so much good about it–I went to their website and ordered a sample pack. Jessica, you made me do it! I’m glad they offer sample packs! I love Casablanca but can only wear one spray due to its potency. I wonder if I’d actually prefer dabbing it. On me there’s a bright, juicy mandarin/grapefruit/orange blossom over top some serious animalics. It’s definitely a weekend perfume. I can’t imagine wearing it to work. Agree — it’s a heavy-hitter! One spritz is enough. I’ve found the Miu Miu to be the most work-appropriate of these three, as long as I don’t spray it on just before I enter the office. The Fawn is easy to wear but I need something less beach-y when I need to buckle down and get work done! I do dab it…I transferred it into a sample dabber..one swipe on the wrist and then transfer onto the other wrist…this is the way I wear it to work.